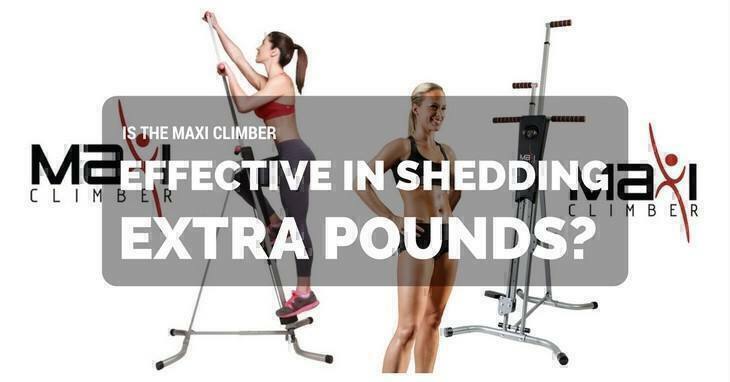 →Is The Maxi Climber Effective In Shedding Extra Pounds? Keep on reading if you want to know whether the Maxi Climber works (and if it delivers on its promises) or not. Let’s cut to the chase: does the Maxi Climber really work? Does it deliver on its promises? Is it any good? Does it make good on its claims? And ultimately, is it as effective as others say or is it all hype? The thing is, this isn’t a question that’s answerable by YES or NO. It’s because just like other exercise machines, there are several factors to consider before we can conclude that it does work. Keep in mind that this isn’t a magic button to fitness. You cannot achieve your goals overnight. Besides, exercise is only one part – you still need to work on your whole lifestyle. The first two claims are true. Because it’s a vertical climber machine, the whole movement mimics the way you use your muscles to propel you up and scale a wall. Yes, it’s similar to rock climbing which allows you to burn anywhere from 500 to 900 calories in an hour. So there, the final question is also partially answered. I say partially because it also depends on other things such as diet, intensity and duration. This is already understandable. You cannot lose weight or achieve your body goals if you’re exercising for an hour every day but eating nothing but fast food during meal times. After an intense workout, you will want to binge on anything because you think you ‘deserve’ it. But eyes on the prize, you need to discipline yourself to eat only healthy stuff. Of course, it also depends on how much calories you need. There are so many recipes you can use without breaking the bank. If you don’t have much time to prepare, there are those which you can whip up in less than 30 minutes. In a nutshell, the more intense and prolonged the exercise is, the more calories you burn. You may think it’s not humanly possible to do a vigorous workout for 60 minutes straight, but you can ‘step back’ a little and go for moderate if you feel like you cannot keep up. The important thing here is to avoid stopping altogether. You cannot go hard on the Maxi Climber for a full 10 minutes then suddenly stop for the same amount of time to catch your breath. If you want to go easy, you can go for a beast mode for about 15 minutes then back to moderate for five then repeat the process. But while rigorous is the best, you also have to assess your fitness level. If it’s the first time you’re getting on an exercise machine, don’t be too harsh on yourself and avoid going beyond your limits. It is subjective. What’s difficult for you may be easy to someone who’s been working out for years. The last thing you want is to suffer from any injury. High quality – It doesn’t feel cheap, to say the least. Once assembled, it’s sturdy and stable. It’s not something that would tip over easily. It’s intense – Even for someone who does regular exercise, it will make your muscle ache during the first few days. That’s how you know it puts all your muscles to work. You can adjust the machine, but you also need to have a good posture, so there’s no unnecessary strain on your back. It’s challenging – If you think an hour on the Maxi Climber is relatively easy, then you need to think again. It will kill your legs (and your whole body will feel like they’re on fire) but the pain will be worth it. It delivers – Once you workout on it regularly, you will notice visible results such as defined arms or toned legs. Again, though, this will depend on the factors above. Based on the testimonials of real users, yes, the Maxi Climber does work. It’s not going to be like a walk in the park though because this thing will make you sweat profusely. Just a few minutes into the exercise and you can feel all your muscle groups working. Still, that’s the same for any intense workout – no pain, no gain. Just follow the correct and recommended posture then you can start exercising your way to a healthier and fitter you. You’ll be one step towards your fitness goal.